UTAR Faculty of Science’s (FSc) Associate Professor Dr Say Yee How received the Plenary Oral Presentation Award in the 5th Seoul International Congress of Endocrinology and Metabolism (SICEM) held at Walkerhill Hotel, Seoul, South Korea from 27 to 30 April 2017. An official annual scientific meeting of the Korean Endocrine Society since 2013, SICEM saw the get-together of over 1,200 academicians, researchers, clinical practitioners, professionals and students from more than 15 economies to share novel ideas and to learn about the latest studies in the field of endocrinology and metabolism. The four-day scientific programme included cutting-edge information on a broad range of endocrinology topics, combining basic science and clinical practice with a spotlight for topics relevant to the Asia-Pacific region. 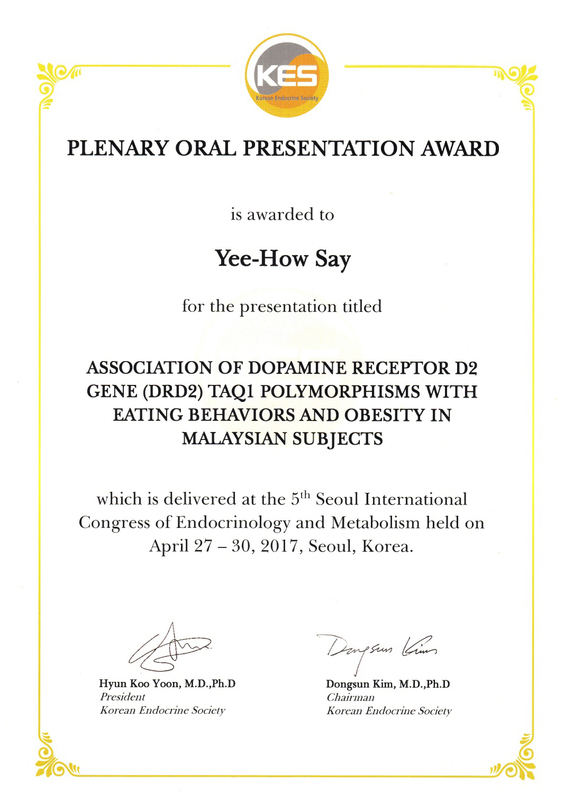 Dr Say’s paper titled, “Association of dopamine receptor D2 gene (DRD2) Taq1 polymorphisms with eating behaviors and obesity in Malaysian subjects”, which highlighted the influence of variants in the gene encoding for the brain chemical transmitter receptor DRD2 in emotional eating, the choice of certain foods and obesity, was awarded as one of the five best overseas plenary oral presentations. 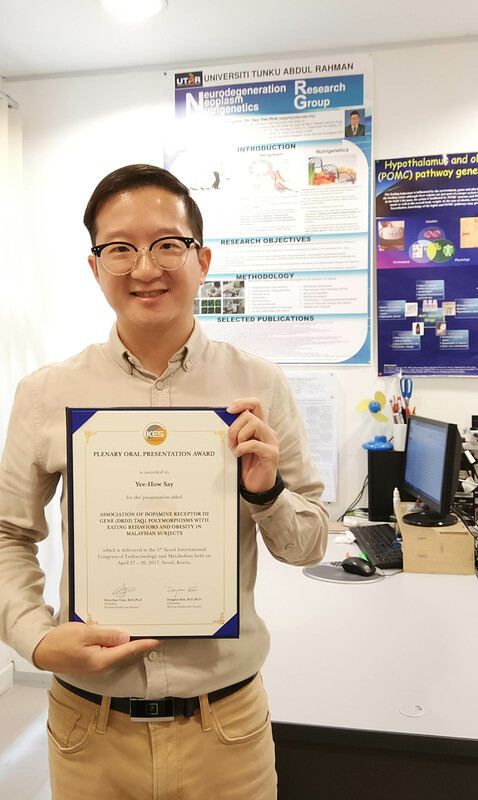 Dr Say credits the work of the study to his Biomedical Science final year project student, Lek Fang Ying, and Master of Science student, Ong Hing Huat. The paper has also been accepted for publication in Asia Pacific Journal of Clinical Nutrition, a journal indexed in the Thomson Reuters Journal Citation Reports. “In this study conducted among UTAR students, the prevalence of the variant forms of the genes, namely Taq1A, Taq1B and Taq1D was 35%, 37% and 11%, respectively. We found that those without Taq1A and Taq1B variants had lower eating restraint, higher uncontrolled eating and preferred fast food more than those with the gene variant,” explained the Biomedical Science researcher. “Meanwhile, those without the Taq1D variant had increased starchy food craving, preferred mamak (Indian-Muslim) food more and had a higher risk to have more fat around their abdomens than those with the gene variant,” he said. “It seems that the gene variants are having a protective effect against unhealthy eating behaviors and obesity,” added Dr Say. “Malaysia has one of the highest prevalence of obesity in Asia-Pacific. The prevalence of overweight and obesity were 33.4% and 30.6% among adults, respectively, according to the Malaysian National Health and Morbidity Survey 2015,” explained Dr Say. “Both environmental and genetic factors account for obesity, with the latter contributing to 40 to 70% of population variation in Body Mass Index, the most commonly used measurement of body fat. Therefore, our group is shedding light on how certain gene variants may lead to a person’s predisposition to obesity,” he concluded. Dr Say is actively researching on the association of gene variants with obesity and its related traits. 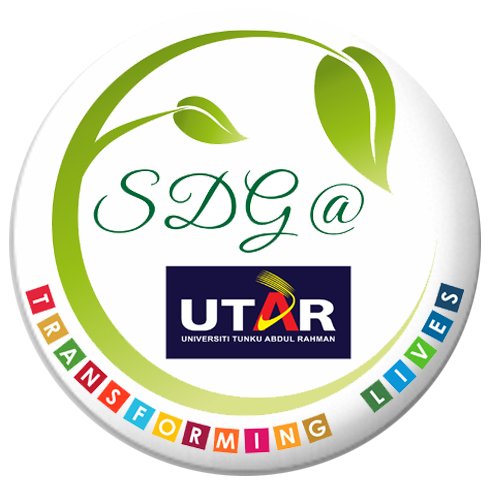 To date, Dr Say’s group has more than 20 research publications on obesity.